Summary: The podcast gang was hanging out behind the boards of a huge hockey event in Brighton Heights. Team Pittsburgh Dek Hockey hosted a “Grow the Game” initiative to bring awareness to ball hockey. 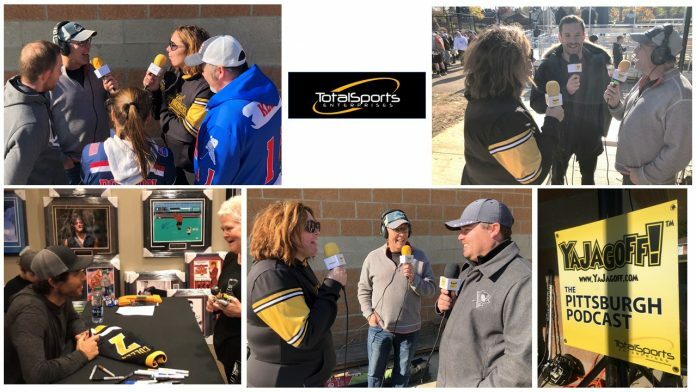 Penguin’s forward Bryan Rust, PPG Paints Arena “ice whisperer” Brandon Radeke joined us along with the hosts of the day, Jason Kelly, Becky Dobson, and Corry Herschk. Oh! And we squeezed in an interview with Pen’s Matt Cullen too….who talked about his liking to dek hockey! Pres the play button below to listen while you work! Don’t see the play button above in your email? Click the one below to listen while you shop for a turkey to cook! SPONSOR: Total Sports Enterprises, where every day is game day, is supporting the Mineo’s Pizza and 93.7 THE FAN. Join us at the silent auction on Wednesday, November 14th, at Mineo’s to help victim families of the Squirrel Hill tragedies. See you at Mineo’s to support the victims and continue to prove that we are #PittsburghStrong. Visit TSEshop.com where every day is game day. WHAT WAS ON THE BLOG? Election Day “sleep-in” and some national NFL broadcasters! Question of the day: What is your go-to stadium food? 04:30 Grow The Game “Peeps:” Corry Hershck, of Team Pittsburgh, Jason Kelly, of Cool Hockey Events, and Becky Dobson, of United Women’s Ball Hockey Foundation, are organizing ball-hockey awareness. Their end game? To increase youth access to ball hockey and, eventually, get ball hockey in as an Olympic sport! They have all played ball hockey at local levels, as well as the world stage as players or coaches. 15:15 Matt Cullen (Pittsburgh Penguins): Rachael goes behind the scenes of a recent public signing with Matt at Total Sports Enterprises. Perfect timing… he is just getting tuned in to ball hockey thanks to his son’s interest in a recent Bill’s Dek Hockey tournament! 19:23 Bryan Rust (Pittsburgh Penguins): He makes Rachael happy by starting out with a kudos to his “hockey mom,” but then we get into who uses the most hair mousse and who controls the music in the locker room? Oh, and his go-to stadium snack? How about Pittsburgh water is excellent for hockey ice! And how thick is the ice? Well…. How Come There’s No Place To Put The Shopping Carts?